My wife Debbie, is a graphic designer and web site developer. She has just recently finished a web site for The Edwards Foundation For Rescued Animals located in Colorado. The foundation is run by a retired couple who takes in animals like horses, goats, llamas and even Zebus! There animals come from various sources: families that can't keep their pets, the forestry service, and the Denver Zoo. These folks finance the care for all these animals out of their own pockets and rely on donations to help keep the animals happy and healthy. All donated money goes strictly to the care and feeding of the animals. I've personally been out to Linda & Johns spread, they are doing a wonderful job caring for these animals. 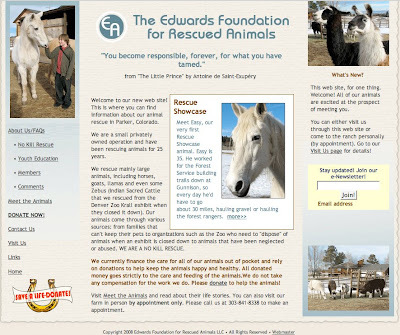 You can read all about The Edwards Foundation For Rescued Animals by following the link provided. As I mentioned above, Linda & John are retired and are absorbing the cost to care for these animals themselves. Take a look at what it cost on a monthly bases to care for these wonderful animals. There is a safe Paypal button to donate, if you can spare a few bucks that would be wonderful.